The Egyptian cabinet approved yesterday a decree-law that criminalises strikes, protests, demonstrations and sit-ins that interrupt private or state owned businesses or affect the economy in any way. The decree-law also assigns severe punishment to those who call for or incite action, with the maximum sentence one year in prison and fines of up to half a million pounds. The new law, which still needs to be approved by the Supreme Council of the Armed Forces, will be in force as long as the emergency law is still in force. Egypt has been in a state of emergency since the assassination of former president Anwar Sadat in 1981. Since former president Hosni Mubarak stepped down on 11 February, Egypt has witnessed escalating nationwide labour strikes and political protests. Amongst those protesting have been university students, political activists, railway workers, doctors, pharmacists, lawyers, journalists, pensioners and the police force. Many labourers have expressed their shock at the decree. “We really had hopes that the new government will support us and look into our demands. We expected them to say we have all of your legal demands on our desks and there is a timeline of a month or two within which they will be achieved,” said Ali Fotouh, a driver in the public transportation sector. Many agree with Fotouh that this decree will incite even more protests and create even more distrust between the new government and the army on one side, and the people on the other. Indeed the proposed law has incited a lot of anger, as can be gauged by the response on Facebook and Twitter. Activists have already called for protests tomorrow against the decree in Tahrir Square and in the main streets and squares in Egypt. “Let’s show them what the revolution is about. Let’s all go out and protest against repression,” posted Hend. For some activists, the law, if passed, will not change anything. “It is another dictator law, the emergency law never stopped labour strikes during the 30 years Mubarak regime,” said Mustafa Basiounu, a member of the Revolutionary Socialists who doesn’t think that this law will affect the Egyptian labour movement in any way. “This only shows us that the new cabinet is launching a counter revolution. I am only surprised they have announced their hatred to the revolution that fast,” added Basiouni. Another problem with the law is its wording with many unclear what it means by those who hamper the economy. “It is so vague, I don’t understand who they mean. They left the TV strike people, but they attacked the students’ strike at Cairo University. What does that mean?” wonders political activist Amr Asaad who is perplexed by the proposed law. Apologies for mixing the two countries. The anti-protest law, the attacks on students and professors inside their own universities, forbidding people from voicing their opinions, all this make it easy to think that we are in Zimbabwe, not Egypt. I congratulated the new government on its effort to establish a democratic path for the Egyptian people in a previous comment. I spoke too soon, now I can see Mubarak's hand running the show while enjoying the sun in Sharm El Sheikh. Wake up my young Egyptian friends before you loose your revolution. Best wishes and salamat. To the Egyptian protesters and trade unionists: I am from the United States and I want to first congratulate you on your successful organization and hard work that brought about the revolution. Second, I want to offer a warning about the intentions of my government in your country. 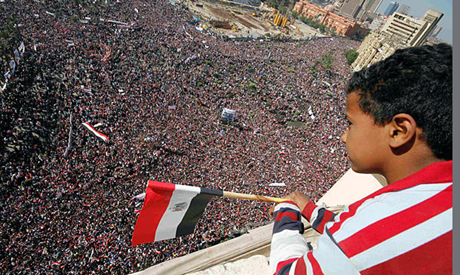 I am certain that the U.S. government will not easily give up the control of Egypt that it enjoyed under Mubarak. I believe they will try to use the Egyptian army to maintain an Egypt that is friendly to U.S. interests. As you probably know, most of the $1.3 billion in U.S. military aid went to top personnel in the army anyway, not to Mubarak. I urge you not to be fooled about the intentions of the Egyptian army or the U.S. government, and Marc, i believe you are quite right, the Revolution in Egypt has just begun. Dont let it be stolen from you. To quote one of my favorite authors, George Orwell, "Power is not a means; it is an end. One does not establish a dictatorship to safeguard a revolution." doing away with a frontman would never have been enough. Revolution has to have clear goals, not people chilling in Tahrir smoking shisha. It needs to have a leader not a whole bunch. Egyptians, you have to organize yourselves before asking the gov to respect your opinion. They can't break you, you have to unity. This is why this is not a revolution: 1. Army is still hiring whatever they want. 2. Army is still passing whatever law they want 3. Army is still changing the constitution to whatever they want. 4. Brotherhood is taking over. Another Iran on the way. Makes me really sad, I was hoping to see Egypt my land move to a better direction. This is what rulers do, gang. Time to hang a few of them from lamp posts, maybe they will get your message. Thing about rules is, you can always ignore them. Too bad Egyptians are not armed, though. That always helps a lot. I say BRAVO to the defiant ones who refuse to be silenced or intimidated! The government is indeed trying to silence voices of dissent in much the same way as the Mubarak regime did. This time their pretext is to "restore stability ." How about they help us restore stability by first responding to our demands?! We are all shocked and dismayed especially as this was the same Essam Sharraf who joined the protesters in Tahrir and pledged to work to meet their demands. The same corrupt people are still pulling the strings all over the country including in state media institutions . The editors in chief have changed their tune but they have already lost their credibility. The government hasnt even given a timeframe for the activists' demands to be met. They risk losing the trust of the people . Let's remind them that we now know the way to Tahrir Square.